Another Battle at the Boat. Another main event featuring two undefeated rising stars. 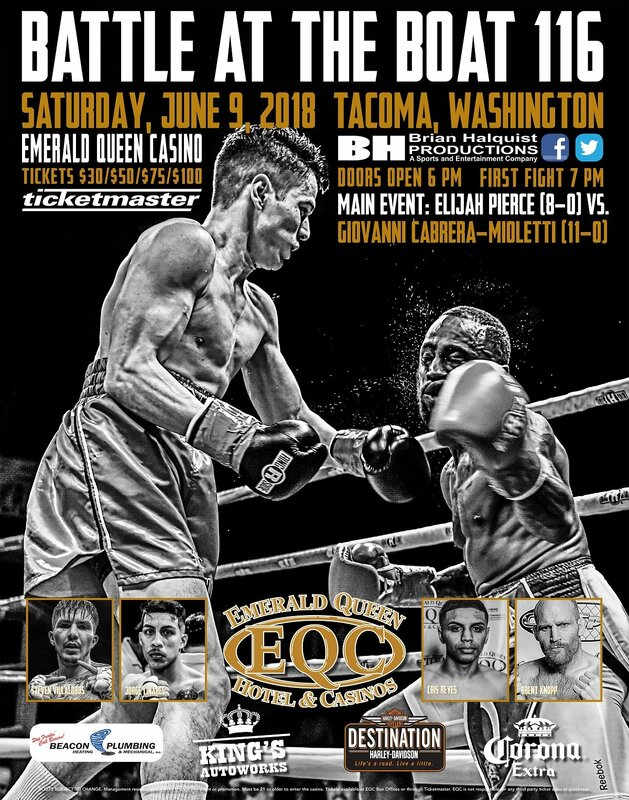 Junior lightweights Giovanni Cabrera-Mioletti and Elijah Pierce will both be looking to keep their records unblemished when they square off against each other in the main event of Battle at the Boat 116 at the Emerald Queen Casino in Tacoma, Wash. on Saturday. The 10-round main event is one of six bouts on the card. The 23-year-old Cabrera-Mioletti brings a record of 11-0 into the contest, while the 21-year-old Pierce is 8-0 with seven of his wins coming via knockout. This marks the second straight fight Cabrera-Mioletti has faced an undefeated fighter. He did just fine the last time out, scoring an impressive second-round TKO win over unbeaten Ray Lampkin, Jr. on March 17. In addition to his victory over Lampkin, Cabrera-Mioletti, a Seattle native who is now fighting out of Chicago, also holds a victory over former Global Boxing Union world lightweight champion Tyrone Harris earlier this year. Pierce will be the fourth undefeated fighter over the last six fights that Cabrera-Mioletti has stepped into the ring with. Cabrera-Mioletti and Pierce will not be the only fighters looking to stay perfect at Battle at the Boat 116, as fellow undefeated boxers Steven Villalobos and Cris Reyes will also be competing on the card. Villalobos (7-0-1) faces Jose Leon (6-2-1) in a 5-round semi-main event at 139 pounds. Villalobos and Leon were initially scheduled to fight on May 24 in Idaho, but a dispute regarding the weight forced that bout to be scrapped. A month later the two will finally face each other. Reyes (2-0) fights a debuting Bryce Gonzales in a 139-pound bout. Reyes is coming off a first-round victory by TKO over Nicholas Credit. As an amateur, Reyes was a 2015 National PAL champion, a 2015 Junior National Golden Gloves runner-up and a two-time Ringside World Championship runner-up, while rising as high as No. 3 in the rankings in the United States. The 18-year-old made his pro debut on Oct. 28, 2017 by defeating Jonathan Arias. Battle at the Boat 116 will feature the VIP experience with 3rdRow Seats being discounted to $75 per ticket. All fans seated in in the VIP section (rows 1-3) will have an exclusive access point and a dedicated server to help create a true VIP experience.